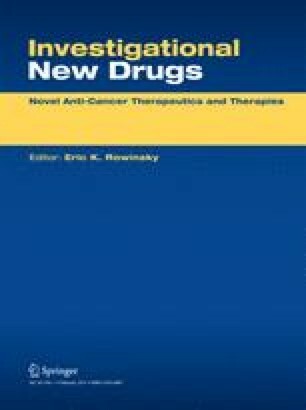 FMAU (1-[2′-deoxy-2′-fluoro-l-β-D-arabinofuranosyl]-5-methyluracil) a newly synthesized fluorinated nucleoside, has potent in vitro antiviral and antileukemic activity and is active in murine leukemia lines resistant to cytosine arabinoside. In the initial phase I trial neurotoxicity, characterized by extrapyramidal dysfunction, was found to be the dose-limiting toxic effect, and a dosage of 32 mg/m2/day for 5 days was suggested for phase II studies. We report a second phase I study of FMAU using this schedule. Mild, transient neurologic dysfunction was encountered in patients treated at the starting dose of 4 mg/m2/day × 5 days and became severe and irreversible in two patients who received the highest cumulative doses administered at the 8 mg/m2/day × 5 days level. Both severely affected patients died. Severe neurotoxicity developed and progressed in these patients despite serial neurologic examinations, including detailed neuropsychologic tests implemented in an effort to detect early neurotoxicity. Because of these findings, further study of this drug as an antileukemic agent cannot be recommended. If it is to be used as an antiviral agent, further phase I study at lower doses is advised.